I have registered for the Covenant Network Conference, The Church We Can See from Here, November 5-7 in Cleveland. As much as I have been involved with this organization throughout the years (my current congregation is affiliated with the Covenant Network) this is the first conference I have attended. I am looking forward to hearing some great preaching, attending some workshops, and hanging out with my sister and brother Presbyterian peeps who are working toward a more inclusive church. Here is how you register. Cleveland is 474 miles from Elizabethton. It will probably take 10 hours or so to make it through the West Virginia mountains including stops. I won't take the plane. Just don't like them. Or I could take the bus. 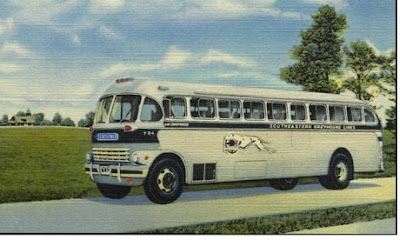 Riding the bus to Cleveland just sounds adventurous, doesn't it? It is a 16 hour bus trip. I do have to be back to lead worship on November 8th especially as it is Stewardship Sunday. I could leave at 4:30 am Saturday and miss the Saturday programming (which would be sad) and make it home around 9:30 pm. Or I could stay in Cleveland until the 6:30 pm bus leaves Saturday and make it home at 8:40 Sunday morning, just in time to catch a shower and stumble bleary-eyed into the pulpit. "I can almost see you all from here!" What do you think, folks? Car or bus to Cleveland?